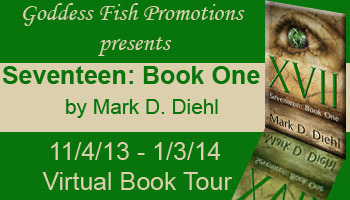 Giveaway information: Mark will be giving away a $50 Amazon or BN gift card. Rafflecopter link is below. Good luck! Most of the world’s seventeen billion people are unconscious, perpetually serving their employers as part of massive brain trusts. The ecosystem has collapsed, and corporations control all of the world’s resources and governments. A bedraggled alcoholic known as the Prophet predicts nineteen year-old waitress Eadie will lead a revolution, but how can she prevail when hunted by a giant corporation and the Federal Angels it directs? The man’s mouth hung open as he stared at her face. His long, ashen hair had shifted, revealing a smudge of grease or dirt that made an almost perfect circle on his forehead. He blinked slowly, pondering her response. “Ah,” he said. “You are a waitress, still. Well, then, General, I would have a cup of Vibrantia, if it pleases you.” The man’s expression never altered and his lips remained mostly still as he spoke, making it seem as though his voice was coming from somewhere or someone else. 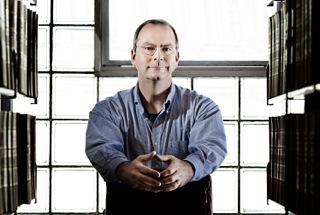 Mark D. Diehl writes novels about power dynamics and the way people and organizations influence each other. He believes that obedience and conformity are becoming humanity’s most important survival skills, and that we are thus evolving into a corporate species. Diehl has: been homeless in Japan, practiced law with a major multinational firm in Chicago, studied in Singapore, fled South Korea as a fugitive, and been stranded in Hong Kong. After spending most of his youth running around with hoods and thugs, he eventually earned his doctorate in law at the University of Iowa and did graduate work in creative writing at the University of Chicago. He currently lives and writes in Cape Elizabeth, Maine. for YA or Adult, an exceptional ghost story! Seventeen year old Arielle is at a crossroads in her life. Disenchanted with her father, she is testing the boundaries of his trust by dating someone he does not approve. Under the moonlit sky in Long Island, Arielle and her boyfriend meet beneath the infamous hanging tree. The couple’s destiny is rooted to the five spirits in the tree whose lives and deaths are determined by an ancient curse. Will her future be determined by the past or will Arielle’s choices alter the course of her life? “Arielle, you promised,.” Chad whispered, assaulting her lips. “I thought you said you love me,” he wheedled. Arielle looked at the leafy canopy. “I do. I really do, but I…I don’t know if I want to do this. Especially here,”  she added practically. Chad wheeled away, clearly annoyed, and bounced to his car door. The car was his pride and joy, a gift for his eighteenth birthday, a Camaro, light blue and totally awesome. It was a chick magnet, and for a minute he wanted to share that with Arielle. They had been dating for almost six months, and he was more than ready to take it to the next level. It wasn’t his first time, and there were plenty of girls interested in him if Arielle wasn’t. Pulling a pack of cigarettes out of the console, he flipped a Zippo expertly, lit his cigarette, and inhaled deeply. Arielle walked over and leaned against the car door nearby, moving close to him, trying to feel his moist body heat in the cool summer air. Crickets chirped nearby, and they watched traffic pick up on the road to the left of them. “Looks like the movie ended,”  Arielle offered up some conversation. “I’m not afraid of ghosts,”  Chad declared, his wide mouth scowling. He wanted to punish her. There had been the promise for so long; he wanted to tell her to put up or he was out of here. She was one of the prettiest girls in the school, with hips that moved so gracefully he couldn’t take his eyes off of her. The pale oval of her face gazed up at him, and he brushed her soft lips with his finger. She had the bluest eyes fringed by black lashes. Those eyes lit up with pleasure, and she rubbed her cheek against his knuckles. Picking up a light brown curl, he twined it around his fingers. 1. Cotton or Silk? Cotton! 2. Champagne/beer/wine? Sometimes wine, maybe once a year. 3. Plotter/pantser: Como say what? 4. Describe your workspace: Small clean desk, three monitors, a phone and pictures of my family. 5. Sports fan or just tolerate it? New York Teams all the way! 8. When did you start writing? 5 years old. Started writing screenplays when I was 18. Started writing novels when I was 30. 9. If money were no object, where would you like to live? A villa at the Mirage in Vegas. 10. What’s next for you? Fulfilling a lifelong dream of writing an epic fantasy novel. As you know, I’ve been on a PNR kick for a while so when I got the chance to read this I was excited. Okay, maybe excited isn’t the best word since I’m jonesing to read Mr. Cash’s book, A Haunting on Long Island (hint, hint) so I thought I’d see how scared he can make me. Well, he succeeded but this book was really different and oh so good. One thing that you should know about the book, it features stories about how the people got to the tree and why. Some of their stories were fascinating and others…well… Anyway, how the tree and Arielle connect was pretty awesome. I did not see the ending coming at all. It was just a simple task that… oops, sorry almost gave away the ending. The only problem I had with the story was that I never figured out about the Gibson Girl. 😉 Maybe another time. Overall, I highly recommend this quick YA PNR. Its fascinating how Mr. Cash wove the stories of the people stuck in the tree and Arielle. Again, the ending was brilliant and I never saw it coming. Michael Phillip Cash’s first book Brood X- A Firsthand Account of the Great Cicada Invasion is presently under consideration for a film adaptation. 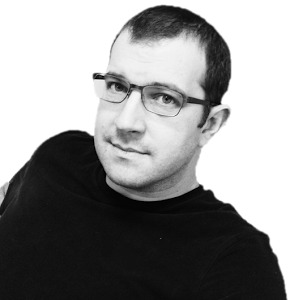 His well-received second novel, Stillwell- A Haunting on Long Island, has stayed on the top of Amazon’s “100 Best Seller” in its genre since its release earlier this year. He is currently working on another ghost story. He lives on Long Island with his wife and children. Michael is giving away 5 signed copies of The Hanging Tree. Rafflecopter is below. 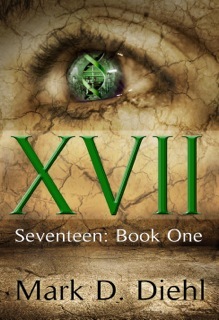 Cassie Scot, still stinging from her parents’ betrayal, wants out of the magical world. But it isn’t letting her go. Her family is falling apart and despite everything, it looks like she may be the only one who can save them. To complicate matters, Cassie owes Evan her life, making it difficult for her to deny him anything he really wants. And he wants her. Sparks fly when they team up to find two girls missing from summer camp, but long-buried secrets may ruin their hopes for happiness. Book 2 in the Cassie Scot Mystery series. Have I mentioned how much I respect and admire Cassie? Well I do. Talk about dealing with the family from hell and now, having to deal with Evan and the life debt? I mean Evan’s a dreamy and all but talk about a guy that needs to step into the right century when it comes to treating a woman. Its 2013, not the 1800’s dude. 🙂 But in the world that Ms. Amsden has created, its how it is. All that aside about Evan, he does what he can to protect Cassie and its endearing to me. Cassie is independent and trying so hard to make a life for her own in a world that is magical and she’s not. I liked her even more in this book. Dealing with deep betrayal by her family and now, she and Evan are getting closer in the romance department. 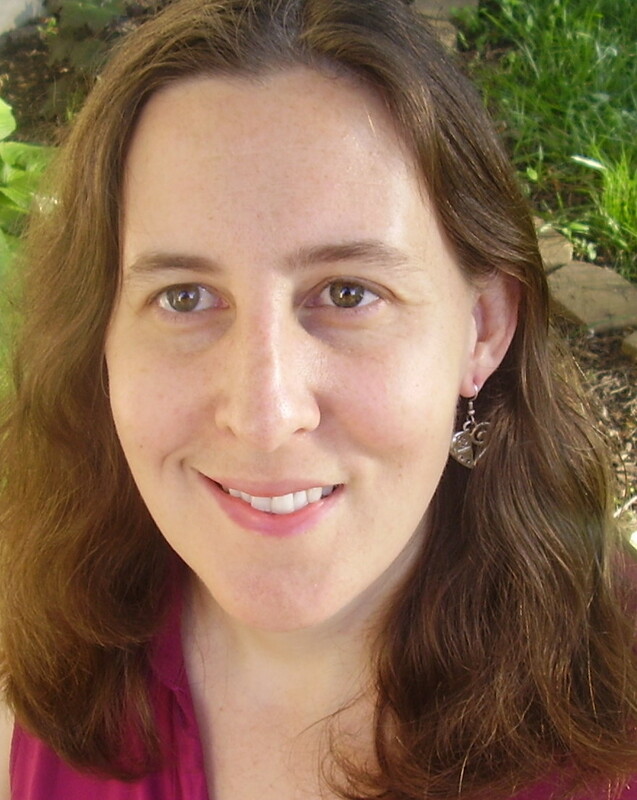 Cassie never loses sight of what she had to do in her job, solve mysteries. And she good at it, too. At the age of 16, Christine was diagnosed with Stargardt’s Disease, a condition that effects the retina and causes a loss of central vision. She is now legally blind, but has not let this slow her down or get in the way of her dreams. Christine currently lives in the Kansas City area with her husband, Austin, who has been her biggest fan and the key to her success. They have two beautiful children. When sorcerers call the shots, what’s a girl without powers to do? Get ready for a ripper of a murder mystery full of romance and intrigue, where magic potions bubble, passions spark and vampires are definitely not your friend. 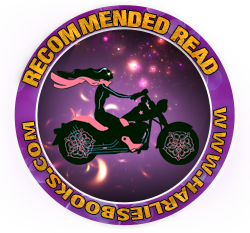 Cassie Scot: ParaNormal Detective grabs you by the heart and won’t let go. Ooooo, Pink loved this book. I like it when an author puts a character like Cassie in world that she doesn’t belong in but also is trying to crave out a life for herself away from her gifted family. Makes for some good old-fashioned drama on the home front. 🙂 Plus, with a family like hers, I don’t think I would want to be “gifted”. Too much to live up to. Evan is a dream. I need and want more of him. I feel as if Ms. Amsden has only peeled away some of the many layers that he has. I can peel them. Pick me, pick me. 😉 I liked the chemistry that has been set up between Cassie and Evan. Plus, what’s up with their families and a feud? More layers to this story than just the murder mystery. I know that rather picky on my paranormals to read because of a certain series (Gag) but I really liked this one. The world building was good, dialogue was crisp and the two leads were relatable and I connected with them. Cassie would definitely be hanging out with me and my friends. Plus, I’m a sucker for suspense in a book. I get that from my sister Harlie. He He! 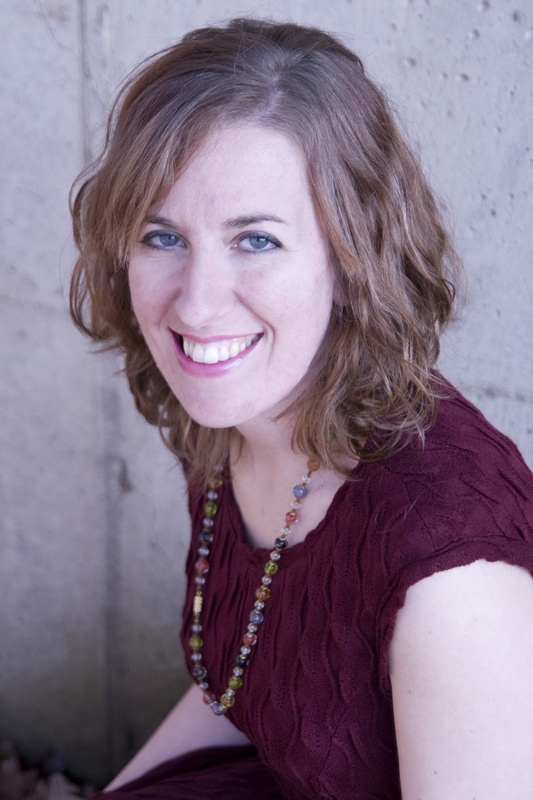 Jen McLaughlin (aka Diane Alberts) is also offering up a special contest. 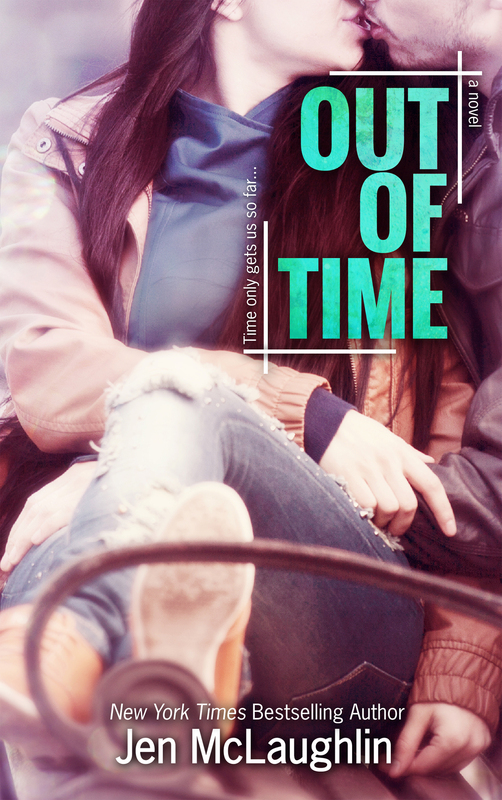 For every 200 adds she gets on Goodreads for OUT OF TIME before the release (December 3rd), she will reveal 5 pages of the book early!If the book hits 2500 adds before the release, she will release a bonus scene from Finn’s POV! You have to add the book to Goodreads in order to get these excerpts released. 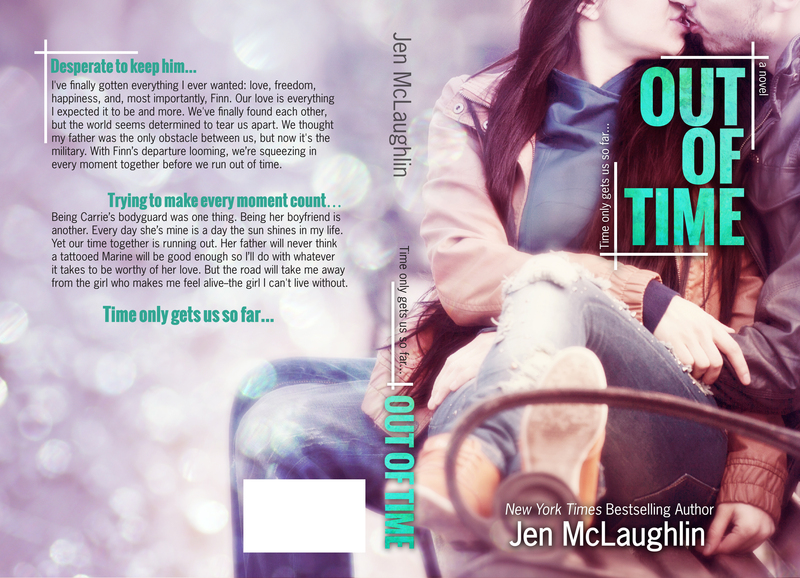 Jen is giving away a signed paperback copy of OUT OF TIME (US only) and 5 ebook copies of OUT OF LINE (international). Rafflecopter Link is at the bottom of the post. Good luck! 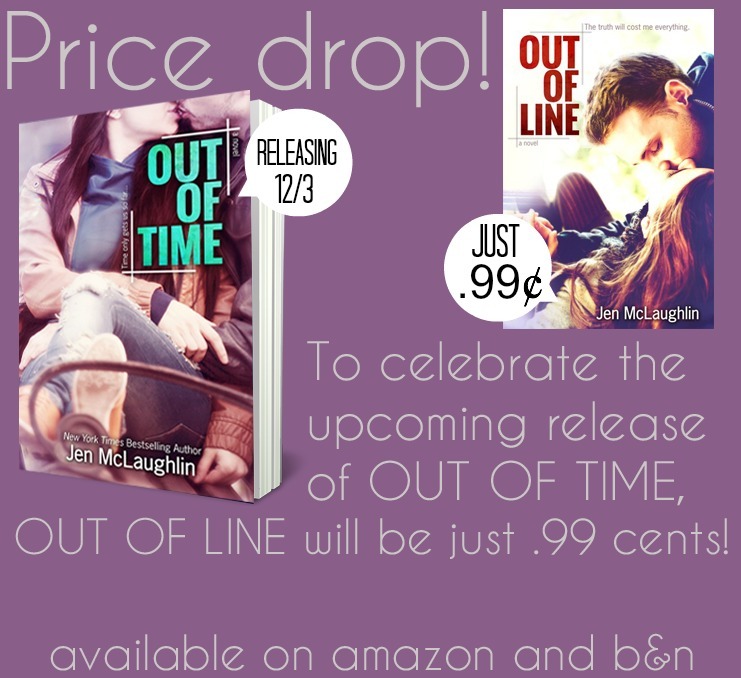 To celebrate the upcoming release of OUT OF TIME, book 1 in the series, OUT OF LINE, will be just .99¢! I’ve finally gotten everything I ever wanted: love, freedom, happiness, and, most importantly, Finn. Our love is everything I expected it to be and more. We’ve finally found each other, but the world seems determined to tear us apart. We thought my father was the only obstacle between us, but now it’s the military. With Finn’s departure looming, we’re squeezing in every moment together before we run out of time. Being Carrie’s bodyguard was one thing. Being her boyfriend is another. Every day she’s mine is a day the sun shines in my life. Yet our time together is running out. Her father will never think a tattooed Marine will be good enough so I’ll do with whatever it takes to be worthy of her love. But the road will take me away from the girl who makes me feel alive–the girl I can’t live without.